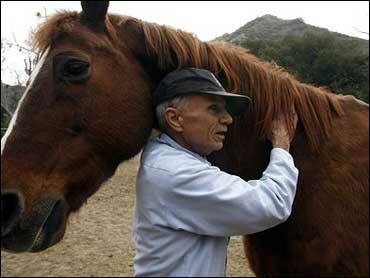 A year after Robert Blake was acquitted in criminal court of killing his wife, the former tough guy actor spends his days exercising horses at a friend's ranch and planning a comeback. He acknowledges the past year has often been a time of despair, particularly the civil trial last fall in which a jury ordered him to pay his wife's family $30 million. But the 72-year-old Blake, who was a child actor in the "Our Gang" movie series and a hard-boiled cop in the 1970s TV show "Baretta," says he's finally begun to emerge from that dark period. "I want to live," he says. "Yesterday was the one-year anniversary of my acquittal," he told The Associated Press on Friday in the first interview he's granted since his civil trial. "I've woken up some nights and wanted to drive till the car goes off a cliff," he said. "And an hour later, poetry is coming to me. I want to go act. I want to go teach. I want to dance. "I can be an actor no matter what happens. I was in the middle of a job when my father committed suicide and I went to work the next day." A conversation with Blake is like riding an emotional roller coaster, as he goes from reflective and poetic to a rant about reporters. "You ask too many questions," he barks at one point. "Don't you know not to interrupt an actor when he's on a roll?" "I'm not on trial anymore," he declares angrily at another point. "You're dealing with Michael James Gubitosi (his given name). ... I'm going to survive no matter what." He threatened to end the interview when he was asked about Rosie, the daughter he had with his late wife, Bonny Lee Bakley. Rosie, now 5, has been adopted by his adult daughter. At another point, saying he wanted to "sing a song to Rosie," he launched into a melodic rendition of the pop song "You Are So Beautiful to Me." "I'd like to give my best performance," he said. "I'd like to leave a legacy for Rosie about who I am. I'm not ready for a dog and fishing pole yet. I'd like to go to bed each night desperate to wake up each morning and create some magic." His conversation is peppered with references to his glory days as an actor, when he starred in such films as "Electra Glide in Blue" and "In Cold Blood," playing a police officer in the former and a killer in the latter. He speaks of lessons learned from actors Spencer Tracy and Fred Astaire and "In Cold Blood" writer Truman Capote. Blake met with the AP at a ranch where he said he is working as "a stable boy." He said the owners, who are friends, let him exercise some of their horses. He also spoke about filing for bankruptcy protection following his trials and railed against "the guys who wear the suits," lawyers and accountants he said profited from his case. The only one for whom he had kind words was M. Gerald Schwartzbach, the criminal lawyer who won his acquittal. "I love Gerry Schwartzbach," he said. "... He's my friend and I'm his friend. He happens to have saved my life." Blake's wife was found shot to death in his car in May 2001, outside a restaurant where the two had dined. He told police he had left her alone briefly while he retrieved a gun he carried for protection and had accidentally left behind in the restaurant. A year after the killing, police arrested Blake on a murder charge. Schwartzbach recently joined Blake's civil lawyers in trying to get him a new trial in the wrongful death case filed by Bakley's family. Blake is noncommittal about the effort saying, "It's up to the judge," but he is critical of the money he has spent fighting the allegation. Before Bakely's death, Blake was a wealthy man who invested money from his film and TV career in real estate. His worth at the time of her death was estimated to be as much as $4 million, but the properties have been sold and much of the money used for his defense. His financial records have been sealed and are in bankruptcy court. Blake said he's broke and living on his Social Security and Screen Actors Guild pension. With his bankruptcy case pending, he said he needs permission just to get a new car. He's living in a small apartment now, a far cry from the homes he once occupied. "I feel like I'm on location in a movie where you're always walking down a long hallway," he said.